New research from Massey University suggests that our Takahē have African cousins and that our Pūkeko are getting friendly with their Australian counterparts. 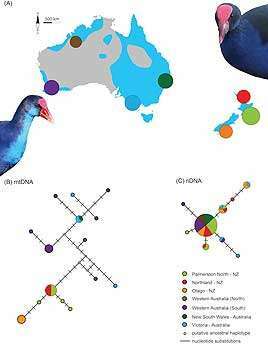 A paper published in The Auk: Ornithological Advances has analysed DNA from swamphens – the group that both Takahē and Pūkeko fall into – to understand how these iconic New Zealand birds evolved. By looking at gene sequences from a number of individuals across Africa, Asia and the Pacific, researchers were able to map the geographic distribution and evolutionary relationships between the birds. Surprisingly, they found that Takahē are more closely related to an African swamphen than other New Zealand hens. When they focused on Australian and New Zealand species, they found that there had been extensive interbreeding between New Zealand and Australian populations. However, you would not be able to know this by looking at their appearance, their physical location or even their mitochondrial DNA. This paper follows on from more extensive work done by The Phoenix Lab, a research group with interests in biodiversity and finding out how species are formed, which looks at the relationships and evolutionary timing of the bird family (Rallidae) that includes both the Takahē and Pūkeko. Team leader of The Phoenix Lab Associate Professor Steve Trewick says research on one group of birds actually informs our wider understanding of evolution and what it means to be a 'species'. "These studies really make us think about what it means when we talk about a species. Just because animals may look very different, occupy different habitats, or not show any intermediate forms, doesn't mean they aren't mating with each other" he says.